Shiraz E-Medical Journal - Is Elevated Mean Corpuscular Hemoglobin Concentration Valuable for Neonatal Hereditary Spherocytosis Screening? Is Elevated Mean Corpuscular Hemoglobin Concentration Valuable for Neonatal Hereditary Spherocytosis Screening? To Cite: Dehdashtian M, Aramesh M, Malakian A, Aletayeb M, Aletayeb 1 M. Is Elevated Mean Corpuscular Hemoglobin Concentration Valuable for Neonatal Hereditary Spherocytosis Screening?, Shiraz E-Med J. 1970 ; 14(3):220-225. Introduction: The elevated Mean Corpuscular Hemoglobin Concentration (MCHC) were reported in neonates with hereditary spherocytosis. Aims: The aim of this study was to assess the reliability of elevated MCHC as a screening test for the diagnosis of hereditary spherocytosis in newborns. Methods and Material: We revised records of 1301 neonates with diagnosis of severe hyperbilirubinemia from September 23, 2009 to September 22, 2011. The cases with MCHC ≥ 36g% were selected. Osmotic fragility test and cell blood counts were performed for cases that were enrolled in the study. Results: Out of a total 1301neonates with severe hyperbilirubinemia, 59 of them had MCHC ≥ 36 g%. Fifty two of 59 selected neonates were finally studied. All of them had MCHC ≤ 35.7g% and a normal osmotic fragility test. Conclusions: Elevated MCHC is not a reliable screening test for the diagnosis of hereditary spherocytosis in neonates with severe hyperbilirubinemia or anemia. Severe hyperbilirubinemia is the leading cause of neonatal hospital readmission (1, 2). A cause for severe hyperbilirubinemia is identified in 36% of cases. Hereditary spherocytosis (HS) is an uncommon cause among the known causes of severe neonatal hyperbilirubinemia (3), however, kernicterus related to HS was reported (4). HS is prevalent among people with Northern European ancestry. Inheritance usually is autosomal dominant. The incidence of HS in the North America is estimated 1 case per 2000 births (5). The incidence of HS is not clear in IRAN. The erythrocyte cytoskletal defects are the etiology of hemolysis in HS and defect in specterin are the most common (6). However, hyperbilirubinemia is the most prominent sign of hereditary spherocytosis , anemia usually is not a problem in the neonatal period (7, 8). In 63% of neonates with HS, hemoglobin concentration has been reported about 14.6 g% (8). Also in HS affected neonates, splenomegally often is mild, reticulocytosis usually is not significant (only 35% of them have reticulocyte counts over 10%) and less than one third of them have a large number of spherocytes in their peripheral blood smear (9). In addition, osmotic fragility test is less reliable for the diagnosis of HS under the 6 months of age (5). Hence the diagnosis of HS is difficult in the neonatal period. There are several studies that reported a high mean corpuscular hemoglobin concentration (MCHC), when assessed by using aperture impedance, is almost always found in neonate with HS (10, 11). This study was conducted to assess the reliability of elevated MCHC as a screening test for the diagnosis of hereditary spherocytosis in newborns. This descriptive research study was approved by the local Ethics Committees of Ahvaz Jundishapur University of Medical Sciences. we reviewed the records of neonates who admitted to Imam and Abozar educational hospitals of Ahvaz (the center of Khuzestan province of IRAN) from September 23, 2009 to September 22, 2011 for severe indirect hyperbilirubinemia, Based on the American Academy of Pediatrics guideline for the management of neonatal hyperbilirubinemia (12). According to Christensen et al (10) study we considered MCHC of 35.9g% as upper limit of MCHC in newborn. Inclusion criteria include the cases with MCHC ≥ 36g% (10) and negative direct antiglobulin test and patients with positive direct coomb,s test with MCHC ≥ 36g% were excluded . The cases were recalled to hospital by telephone. After explanation about the study and acceptance of child parents, a blood sample for cell blood counts and Osmotic Fragility Test (OFT) were obtained. The history of readmission was recorded for hyperbilirubinemia, splenectomy, anemia and gallstone in the family. Erythrocyte indices were obtained by cell counter model Sysmex KX21N. After 24 hours incubation of samples in environmental temperature of 37°c, osmotic fragility test was done. Statistical analyses were performed using Statistical Package for Social Sciences, version 15.0 (SPSS, Inc., Chicago, IL, USA). Chi-square test and T-correlation analysis were used for statistical analysis. Between September 23, 2009 to September 22, 2011, 1301 neonates with severe hyperbilirubinemia were admitted to Imam and Abozar educational hospital of Ahvaz, the center of Khuzestan province of IRAN. Fifty nine of them had MCHC equal or greater than 36g% and negative direct coomb,s test. Fifty two of them answer, in reply to recall. Thus, the study group comprises the 52 cases .At recall time, all of the cases were above fourteen months age. The mean and Standard Deviation for birth body weight of cases who respond to recall were 3025.3 ± 56g. (Range: 1770g –3950g). Their recorded total serum bilirubin value was 18.8 ± 2.6 mg% (range: 14-29.2mg). 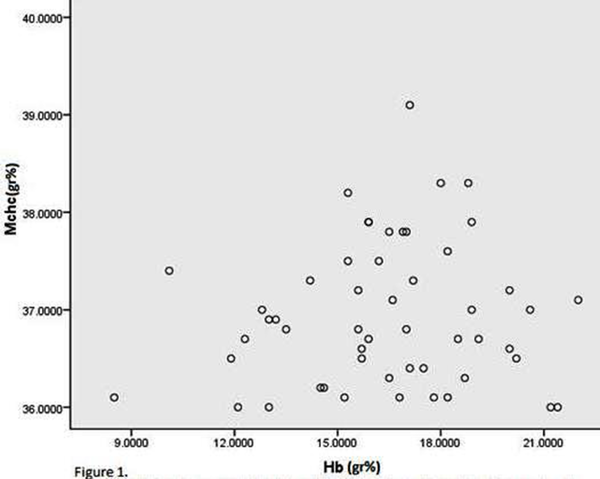 The recorded mean ± SD of MCHC and hemoglobin values at admission to hospital for hyperbilirubinemia were 36.94 ± 0.73g% (range: 36- 39.1g %), and 16.36 ± 2.86g% (range: 8.5- 22g %), respectively (Fig.1). The mean ± SD of hemoglobin and MCHC values of them at recall time were 12.6 ± 1.1 g% (range: 9-14.7g %), and 33.3 ± 1.5g% (range: 28-35.7g %), respectively. Nine of the 52 cases had hemoglobin value lower than 14g% at admission time for hyperbilirubinemia in neonatal period. One of the nine cases remain anemic (Hg < 11g %) at recall. In addition, another child who was not anemic at neonatal period, had hemoglobin concentration lower than 11g%.The RBC indices of these two children were compatible with microcytic hypochromic anemia and HgbA2 was greater than 3.5g%. There was not any history of splenectomy, gallstone and anemia required treatment in cases or their families. Eight of the cases had ABO incompatibility but negative direct antiglobulin test (mother blood group o +, and neonate’s blood group A + or B +). Five of the 52 cases were with glucose 6 phosphate dehydrogenase deficient. All of the 52 cases had normal osmotic fragility test. consisting of the 5th and 95th percentile values, is extract from tests performed on neonates with minimal diseases, who required blood sampling (16, 17), thus the high MCHC may be a normal variant in neonatal period. Hemolysis, due to ABO and Rh incompatibility, causes lowering of hematocrit and increases the MCHC level. Eight of our cases had ABO incompatibility, but direct coomb,s test was negative and there was not anemia in all of them. G6PD deficiency was detected in 5 of cases. The presence of heinz body and false elevation of hemoglobin may be shown MCHC greater than normal in G6PD deficient patients, but anyone of our G6PD deficient cases did not shown hemolysis. Only 52 of 59 cases with MCHC ≥ 36g% respond to our recall, thus this is a limitation for our study. MCHC ≥ 36g% is not a valuable screening test for diagnosis of HS in neonate. We thank ziae T, Taheri M, Mortazavi M (Division of neonatology, , , ) who permitted us to use their patient’s data. This study was supported by a grant (U-90187) from the jundishapur university of medical sciences, .